This is they guy who has rescued me whenever a hard drive has failed or I needed to upgrade my computer. This is a guy who played collection agent, sans brass knuckles, when our client put off paying me for way too many months. Couldn’t imagine what he needed because he sounded so sheepish on his message. A wedding invitation for a relative was my guess. Nope! “I’ll buy you dinner,” he insisted. We were short on time. So we had dinner with Max at Subway. Max was exceedingly shy. I could see I’d have to pull out all the auntie stops. I told him how much I liked meatball sandwiches too – even though I ordered something else. I asked him about his buddies in the Cub Scouts. I told him my favorite subject in school was recess. Hmmm, this was going to be interesting. 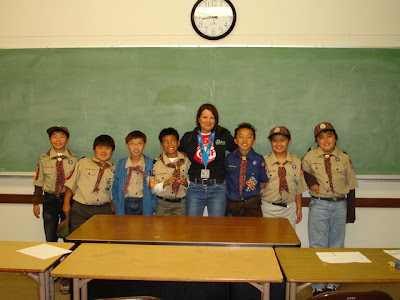 The Cub Scout meeting took place in the classroom of a Buddhist temple. The kids lined up according to the troop number for the pledge of allegiance. They were exceedingly cute, hyper boys. It was a Friday night. The parents looked happy to see each other, yet exhausted. I was glad I didn’t have to do this every week. When the boys first arrived in the classroom, they had to draw pictures for soldiers who were in the hospital. Then the Scout leader called me up to the front of the classroom. I commended them for drawing pictures for the soldiers and told them about Operation Rebound and the soldiers who participated at Oceanside. I showed them the CAF flyers and they were riveted. The Scout leader piped up, “If those guys can keep exercising after losing a limb in the war, we have no excuses.” He sounded exactly like Rudolph’s flying coach. Gruff and enthusiastic. “What if you have asthma?” one boy asked. I told them about my friend Stacey who does her races with an inhaler. “Do you know how to change a flat tire?” another asked. I told them how important it is to know how to maintain your own bike. Of course, I gave them the helmet lecture. Showed them all the wrong ways to wear a helmet and quizzed them. Acted really silly in the process. I also told them about a local kid’s triathlon. I showed them my tri bag and all the stuff I used in my race. Plus, the tri magazines I read. Coach Beth said, “Show ‘em your medal!” They were impressed. When I was done, I sat in the back of the classroom while the Scout leader went over other stuff coming up. I wondered if I got through to them. I wondered if any of them would ever do a tri. At the end of the night, a skinny boy with glasses came up to me. “I wanted to ask you something else. But not in front of the other kids,” he said. His dad looked on. “Sure!” I said. “What do I do with my glasses in a triathlon?” OH, A BOY AFTER MY OWN HEART. I’ve worn thick glasses since I was five years old. “You could put them in a hard case while you’re doing the swim,” I answered. “I know how important it is to protect your glasses. When I was little, I once broke my glasses three times one fall, playing football. My mom was mad, but she never discouraged me from being active. So whatever you do, don’t let those glasses keep you from getting out there okay?” He nodded earnestly, “Okay!” I high-fived him. Thanks for coming to Max's scout meeting. First, he didn't want to have dinner with you. But on the way back, he said he loves auntie Amelia. He is your little not-so-secret admirer now.